In 1860, at the dawn of astronomical photography, a total eclipse event occurred in which the shadow of the moon passed over North America, Spain and North Africa. There was great excitement throughout the scientific community and many astronomers traveled to witness the event. Warren De La Rue (1815-1889) was one of these, a pioneer solar photographer, he produced these iconic images of the 1860 totality in Spain. “By the kindness of the eminent astronomer, Mr. De la Rue, I have here (Figs. 58 and 59), photographs of the most interesting phenomena observed at the last total eclipse. 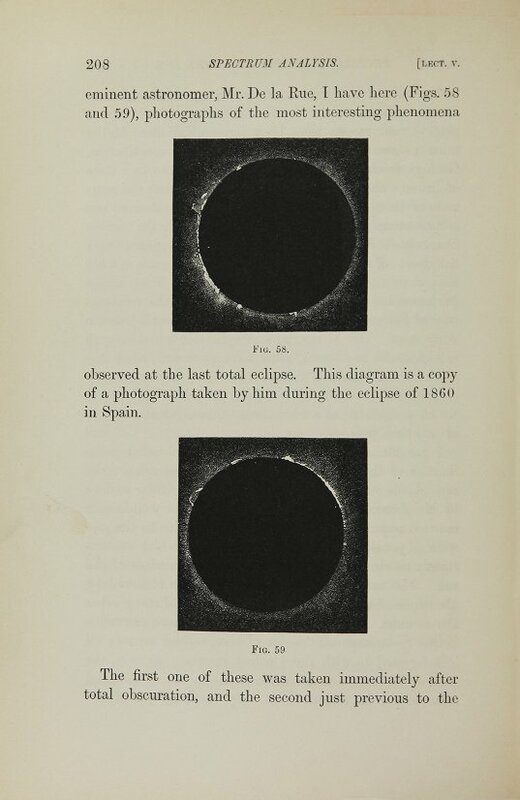 This diagram is a copy of a photograph taken by him during the eclipse of 1860 in Spain. The first one of these was taken immediately after total obscuration, and the second just previous to the reappearance of the sun. Even today, when we can view the sun from space, the Great American Eclipse of 2017 was cause for excitement among scientists and ground-based studies of the event abounded alongside observations from aboard the International Space Station. The scale of the eclipse made it an historic occasion, in which people from all walks of life participated, coming together to experience this awesome phenomenon across the nation. Today’s proliferation of media will provide a rich account of the event to future historians of science. So here Circulating Now contributes to the historical record the personal observations and photographs of NLM staff and contractors who recently took leave from their work, along with millions of others, to witness the once-in-a-lifetime total solar eclipse of 2017. Earlier this summer, I tuned into a National Public Radio interview of science writer/correspondent David Baron. He had recently written a book called American Eclipse and was speaking about his experiences as an eclipse chaser (at times referred to as an “umbraphile”), who had encountered several of these unique celestial phenomena from different parts of the globe. What he described seemed almost spiritual. David Baron’s use of words such as “surreal,” “primal transcendent,” “indescribable,” and “awe inspiring” captured my attention. I felt excitement, wonder, and an almost anxiety-producing need to experience this once in a lifetime occurrence. 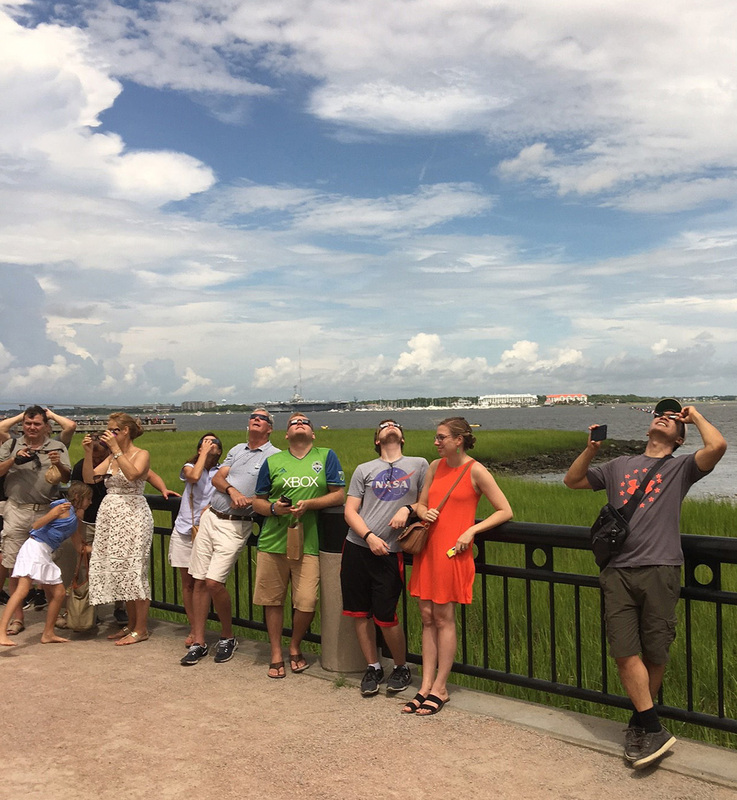 I completed travel plans with a friend, Alex Chao, to journey to Charleston, South Carolina, on the “path of totality,” to witness a total solar eclipse over the city in the early afternoon hours of August 21, 2017. On the day of the eclipse, we staked out an area adjacent to the Charleston Battery overlooking the Charleston Harbor to the east, and a series of very stately antebellum homes to the west. 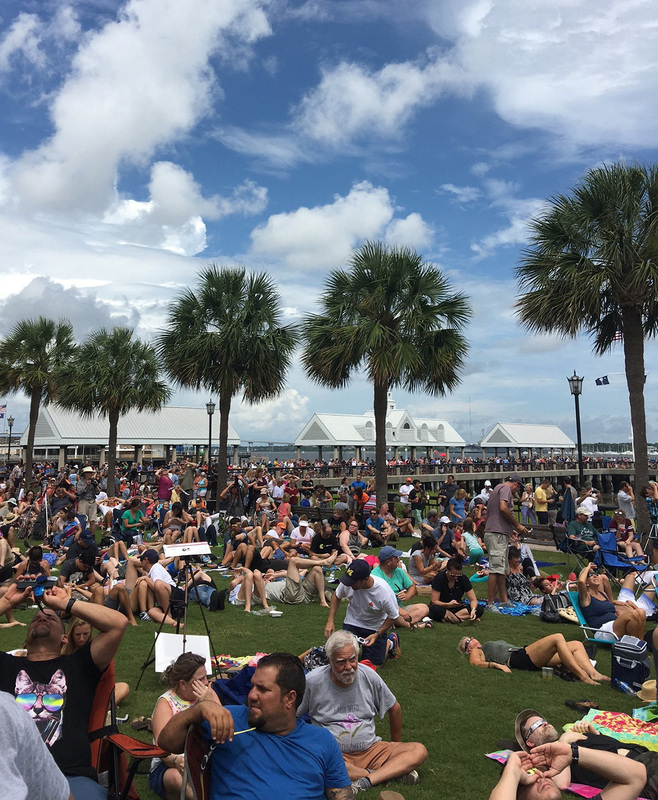 I saw many hundreds of others who converged on Charleston to see the eclipse looking skyward towards the sun wearing darkened solar- filtered glasses. Occasionally the sun would appear in a small patch of blue sky and with our filters Alex and I could see exactly how much of a bite had been taken out of the sun, courtesy of the moon’s shadow. I was primarily interested in the ambience the eclipse created in the sky, the ocean, and the land. As more of the sun’s surface became covered in shadow, the temperature dropped and the wind picked up intensity. It’s remarkable how bright the surrounding area of sea, sky, and land remained even with approximately 95% of the sun covered by the moon’s shadow. Silence from the crowd turned to cheering as the sun’s surface, now completely covered in shadow, was no longer able to cast waves of light. We had a window of opportunity to look at the eclipse safely for about 90 seconds. I glanced up only for about five seconds, but I’ll never forget it; particularly the streams of light that emanated from the perfectly round circle of darkness. We were guests at Wilson Ranches Retreat, a 9,000-acre working ranch just outside of Fossil. On Monday, the skies dawned clear and dry. Our ranch hosts drove approximately 20 of us by four-wheel drive to a high point on their property, in the path of totality. Atop a broad plateau mountaintop covered with sagebrush and grasses we had an unobstructed view of the sun to the east, as well as Mount Hood and Mount Adams to the west. During totality, which lasted approximately 90 seconds, the temperature dropped, bright stars became visible (notably Venus), and the mountains in the distance were first shrouded in darkness and then soft light. The sun’s corona was fully visible to us during totality, shimmering and glowing bright white against the larger-looking black circle of the moon, allowing us to also see the “Bailey’s beads” and the “diamond ring” phenomenon. View of eclipse from Asheville, North Carolina. Photo by Lena Kohls. 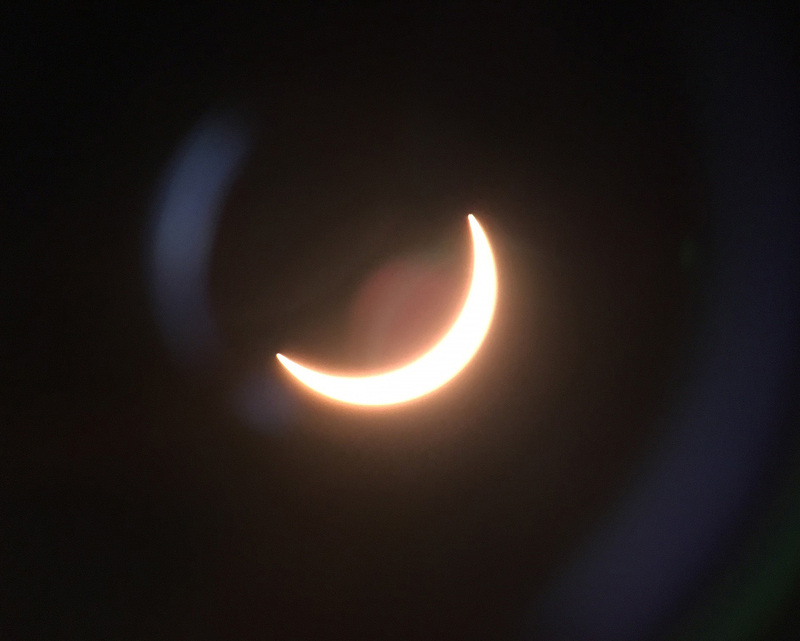 View of eclipse from Richmond, Virginia. Photo by by Lalita Kohls. John Rees using a pinhole to view the eclipse. Photograph by Christie Moffatt.